How do you like your Locust? Black or Honey? On the occasions that I might presume to dispense permaculture know-how on this blog, it’s always from the point of view of the fellow beginner, blundering around in a sea of ignorance, incomprehension and incompetence, rather than me ever claiming to be an “expert”. I think that this can be rather reassuring for a fellow beginner: to read of tales of occasional success set against a background of mistakes and failure, making them feel that their own stumbling progress is quite OK and not to be measured up against the pristine examples of the true expert. Coupled with my vague idea that permaculture knowledge should be ”open source”, I plan to publish a series of FREE permaculture fact sheets under the title of “The Blind Leading the Blind”. Our talented artist friend Alastair has already supplied the artwork, see above. However much of a beginner you consider yourself, be prepared to question received knowledge; perhaps that approach is actually a requisite of permaculture? 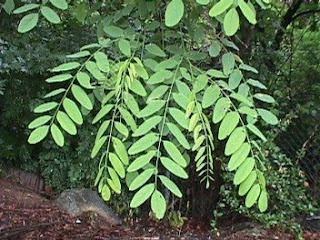 Here’s a recent example, which concerns our planting of a few black locust (also known as false acacia and, in Latin, robinia pseudo-acacia) a plant I believed to be an archetypal permaculture panacea. In his The Earth Care manual: A Permaculture Handbook for Britain and other Temperate Climates, Patrick Whitefield (who taught my Permaculture Design Course) says that black locust “provides: fodder of bees, edible seed for chickens, edible foliage for grazing animals, timber … and nitrogen fixation.” p.33. In The Woodland Way: A Permaculture Approach to Sustainable Woodland Management, Ben Law says, “Nitrogen fixing trees like alder and black locust will make a useful addition to any agroforestry system whether over pasture or arable crops.” p.17. So, imagine my surprise when, tucked up in bed one night with a cup of cocoa and Gene Logson’s All Flesh is Grass: The Pleasures and Promises of Pasture Farming, I read that “Black locust... is not a good pasture tree. Its leaves are considered toxic to animals.” Hmmmm? I searched around on the Internet and came up with this entry on Wikipedia: Unlike the pods of the honey locust, but like those of the related European Laburnum, the black locust's pods are toxic. In fact, every part of the tree, especially the bark, is considered toxic, with the exception of the flowers. However, various reports have suggested that the seeds and the young pods of the black locust can be edible when cooked, since the poisons that are contained in this plant are decomposed by heat. Horses that consume the plant show signs of anorexia, depression, diarrhea, colic, weakness, and cardiac arrhythmia. Symptoms usually occur about 1 hour following consumption, and immediate veterinary attention is required. There is some confusion around black locust and honey locust. In the past both have just been called “locust” in North America and the uses of both have sometimes been mixed up. Black locust is an excellent fast growing n-fixer and a good bee plant. They have more experience of growing it in pastures in Eastern Europe than North America. In Hungary the leaves are valued as excellent fodder, especially for goats and rabbits. Whether it is toxic to horses, I don’t know but it won’t be to sheep if goats are fine with it. However, the seeds do contain toxins when raw, so it is probably not best used as a major feed for chickens. The Hungarians report no problems from ruminants eating the seeds pods. Honey locust was thought not to fix nitrogen until a few years ago because they don’t produce nodules like most n-fixers. Then someone discovered the fix N through a different mechanism, so now they apparently do. However, I don’t recommend it for France in pastures, as it is very slow growing and will require many years of protection from grazing stock. I wrote to Patrick Whitefield of my discoveries; he said: “After reading what you’ve written I’ll certainly make an amendment in the Manual next time it’s reprinted and also when I’m teaching. Interesting about Glenditsia too. So there you have it, the not-quite-definitive answer to the question I began with. Do question received wisdom and do share the results of your research. Thanks to Magnus for posting a question (as a comment), to which this is, I hope, a useful reply. A mightily well researched bit of acacia tracking there. Sounds like 'it depends' is the answer. I found the wiki link useful. Couldn't face wading through books at this hour. - because they are a 'weed' noone seems to care if you rip them out of the side of the road. ie they're free, so why not. I'm not sure which one we have here. they just call in Mimosa in Portuguese, which they add with a scowl as, they say, it's a 'praga', which i added to my on board register as 'weed'. And fair enough, where it grows, little else gets a chance to flourish. It could be the 'acacia catechu' from the pic in wikipedia, but i thikn i align myself to the 'acacia confuso' fellow down the line! Quite fancy a bit of bamboo myself. any ideas about that? I stumbled onto this blog and am so impressed, I am nearly speechless. You are adding immense creditability to the Permaculture movement, Bravo! I look forward to reading all your past posts. Thank you. 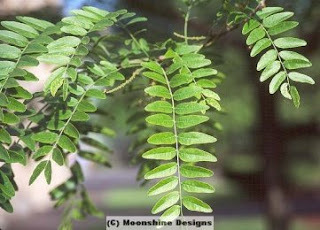 I just thought I would add my knowledge of black locust here for anyone who is interested. When I moved to my property in western Washington state, USA there were many of the trees here. I have since cut down because in my climate, mild and very wet, they are an extremely invasive species. They have escaped cultivation and are on lists of species to avoid planting put out by restoration groups. I cut them down 4 years ago, and they are the #1 weed in my garden, and probably will be for the next decade or more. If you live in a climate similar to mine, I would think very, very seriously before planting this species. It is the properties that make them a good pioneer species that also allow them to invade disturbed ecosystems as they do here. They do however fix nitrogen and I am grateful to them for the wonderful soil they have left behind. They might also make a nice tree for coppicing, as the stumps sprout prolifically and the wood is very strong, rot resistant and makes great firewood. However the young wood is covered with lots of really nasty thorns, which is a drawback. I feed the leaves from the sprouts to my chickens and they love them. I haven't had any ill effects in two years of doing this, so the leaves at least are not toxic to chickens. Happy permaculturing! I have read conflicting information regarding the value of Elderberry as chicken fodder. One source I found said it was toxic! I speculate it is the leaves that are toxic and the fruit OK to be ingested? Come to think of it I have read conflicting info on Comfy, including a warning that pregnant women should not drink the milk of goats who have eaten Comfy. Luckily your goats don't seem to like it! So glad to see people questioning authority, even "alternative" authorities like the certified teachers of permaculture. Keep up the good work. I can't wait to read your book on animals in permaculture! this is good info, thanks for the clarity! 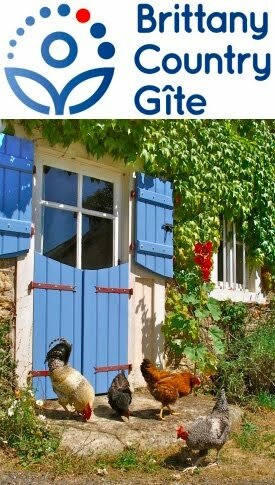 I'm also relatively new to permaculture and there is so much info to wade through. and lots of the information may not apply to the specific climate. however simple concepts like chop n drop - growing your own mulch and nitrogen on site - is very important for people to understand. and re: the person who mentioned calcium, phosphorous and potassium - yes they are important but usually they exist or can be brought out about through other permaculture techniques like using cover crops to bring it about. a good book - designing and maintaining your edible landscape - has charts on what crops accumulate what nutrients. also to make the nutrients more available, you simply need to increase the humus content and a black/honey locust would bring that about as the root hairs dig and die and decompose and the soil comes to life. re: the black locust, I read on this blog (great back to the land blog btw) that his friend who was a Buddhist told him the land wanted to speak to him and so he went out and "heard" not to plant black locust, which he was considering! ha... so be careful with this one, eh? btw I also have a blog where I post permaculture info and other goodies related to sustainability! Well done on a good bit of research! I personally would never entertain a tree like black locust as part of my holding as firstly I also believe it to be toxic to livestock and also because its not native! !........rhododendron was not native to GB and now everyone spends time and money getting rid of it!! so I always think it best to look to tradition! Thank you for posting your 'research' into the possible toxicity of black locust/honey locust. I am raising Dominique chickens in the yard and have at least 5 fully mature trees in their penned area. While researching how these chickens tolerate cold, frigid conditions, I came across a reference in Carla Emery's Encyclopedia of Country Living stating that black locust leaves/seeds are toxic to chickens, and I became immediately concerned. They have been been eating the dried leaves, and have nott seemed to suffer any consequences. Your article has eased my mind-so thank you!